As many as 350,000 Americans emigrated from east of the Mississippi River 2,000 miles to Oregon and California along crude wagon roads from 1841 to 1869. This was the largest voluntary mass migration in American history. It was sparked by tales of early mountain men and explorers in search of riches in the unknown land. The movement accelerated after the discovery of gold in California in 1848. The masses of wagon emigration effectively ended in 1869 with the completion of the transcontinental railroad. 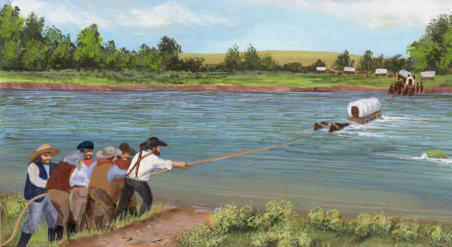 Most emigrants left towns along the Missouri River in Missouri, Kansas and Nebraska in wagon trains. Travel was slow averaging 10 to 20 miles per day, and conditions could be extreme. The earliest travelers were headed to the Willamette Valley in Oregon or the gold fields of California covering almost 2000 miles in about 5 months. Travel expanded to Utah after settlement by the Mormon’s in 1846; to gold fields in Nevada and Colorado in the 1850s; and gold fields of Idaho and Montana in the 1860s. Need for a transcontinental railroad to join the fast growing west coast with the rest of the country was recognized as early as the 1840s and into the 1850s, but cost and political differences on location of the route prevented adoption by Congress. As a compromise, Congress passed the Pacific Wagon Roads Act in 1857 providing funds to improve the wagon roads to the Pacific Coast. As part of Pacific Wagon Road improvements a new 256-mile cutoff was constructed between South Pass (current Wyoming) and Fort Hall (near present-day Pocatello, Idaho). Unlike other emigrant trails that evolved from repeated use, the Lander Trail was actually a surveyed, engineered and constructed road, one of the first federally-constructed roads west of the Mississippi River. The new route was used by emigrants traveling to California, Oregon and the gold fields of Montana and Idaho. The new route saved as much as seven days travel compared to existing routes. It avoided long waterless desert crossings and expensive ferry crossings lower on the Green River. The new road was engineered and built in 1858 by its namesake, Frederick Lander and a crew of about 100 men. 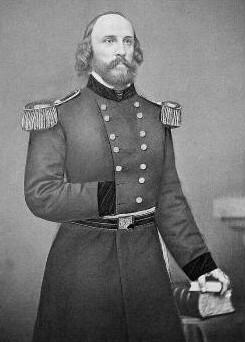 Lander had an extensive background in railroad construction in the east and had been part of the Pacific Railroad Survey in 1853. He worked on improving emigrant trails from 1857 until entering the Civil War in 1861. Lander died from a battle wound in 1862. He estimated that 13,000 emigrants used the new road in its first full year 1859. The road was used extensively until the transcontinental railroad was completed in 1869. The road continued to see some emigrant traffic into the 20th century and played an important role in the settlement of the upper Green River Valley. 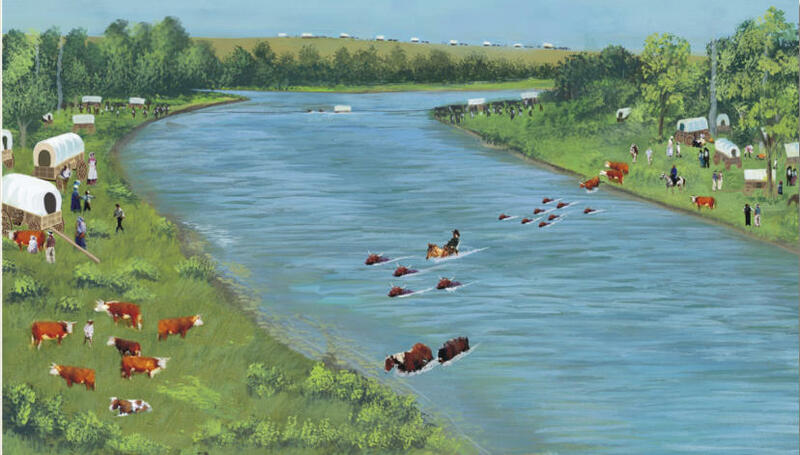 Major river crossings like the New Fork were significant markers for the emigrants because of the peril in crossing, but were also common camp spots because of available grass, wood and water. The New Fork River Crossing was one of the most difficult on the Lander Trail. 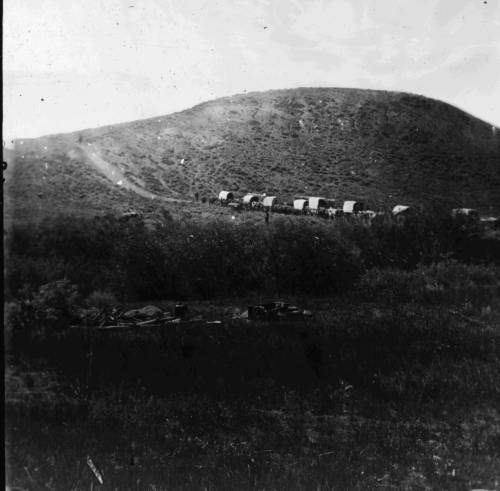 Due to the difficult crossing and the preceding all-day 18- mile desert crossing, most emigrants camped on one or both sides of the river making this location one of the busiest on the trail. During high water hundreds of wagons could be waiting their turn to cross. Lander selected this crossing location because of a large island that split the river into two smaller channels which could be forded by wagons without the need for an expensive bridge or ferry. The old island has since been cut in half by the river, but its remains are a reminder of the emigrant days. Having crossed the Continental Divide just a few days earlier and being about half way on their 2000-mile, 5- month journey, the lush grass and abundant cottonwood trees must have been a brief oasis for weary travelers that still had many difficult miles to go. At this point they were at least on the back side of their journey.